President Obama’s budget will include cuts to Medicare and Social Security and tax increases. This does not change what Obama was offering Republicans — he offered the same thing during fiscal cliff talks last fall — but it does mean pundits will declare he is offering a serious budget for serious times, DOA or not. Would it matter, one reporter asked the veteran legislator, if the president were to put chained-CPI… on the table? “Who wants to do it?” said the legislator. “The president,” replied the reporter. “I’d love to see it,” laughed the legislator. Their skepticism is healthy. A “senior administration official” told Politico’s Mike Allen that Obama’s budget “isn’t a menu of options for them to choose from; it’s a cohesive package that reflects the kind of compromise we should be able to reach.” That means no entitlement cuts without tax increases. That is the same position Obama’s had since the debt limit fight in 2011. The GOP wants entitlement cuts without tax increases. That is has been the GOP position forever. Cantor’s position — “we’ll see” if Obama’s serious about entitlement cuts — is the same both before and after the Friday morning reports that Obama’s budget includes entitlement cuts. “I’m in a wait-and-see mode as to whether this White House is very serious,” Cantor said on CNBC Friday morning. “There are some things we can agree on.” You would think Obama’s putting it in writing (again) would give him some indication of Obama’s seriousness. But Cantor was more candid on what that meant in mid March: “If the president wants to let our unwillingness to raise taxes get in the way, then we are not gonna be able to set differences aside and focus on what we agree on,” he said. So the real change Obama’s budget brings is praise from centrist reporters and pundits. As Politico’s Allen notes, MSNBC’s Joe Scarborough said Friday, “Now this is a real budget… That’s a real budget… exciting… a place to start.” The Washington Post explained Obama’s budget “will break with the tradition of providing a sweeping vision of his ideal spending priorities, untethered from political realities.” The New York Times said it “departs from the usual presidential wish list that Republicans typically declare dead on arrival.” NBC News’s First Read said Obama could have picked Door No. 1, “a pie-in-the-sky wish list,” or Door No. 2, a budget “that tries to make a serious offer to congressional Republicans to get them back to the negotiating table. Well, we now have an early answer — he’s selected Door No. 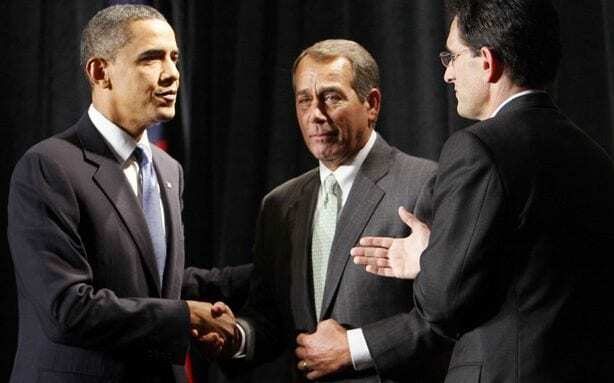 2.” National Journal’s Ron Fournier writes, “Washington is edging closer to a budget deal, thanks to a gutsy change in strategy at the White House.” If Obama’s budget pushes Washington closer to a deal, that’s great. But it is not a change in what Obama’s been offering for months. The New York Times’ Paul Krugman says he fears “Obama is still trying to win over the Serious People, by showing that he’s willing to do what they consider Serious — which just about always means sticking it to the poor and the middle class.” Whether Obama’s dinner diplomacy with Senate Republicans will be successful is yet to be seen, but he has made great strides in pundit diplomacy, Krugman aside. This entry was posted on April 5th 2013 at 4:45pm/16:45 and is filed under Law & Justice, Live News Column 2, Politics. You can follow any responses to this entry through the RSS 2.0 feed.